You must be running Microsoft dot net version 4 or later. If you don't have this, go to the Microsoft Download Center and download and install the latest version. Unzip the DML package to wherever you are going to run it from. When this is done, create a desktop shortcut and away you go. If you aren't sure how to create a shortcut, simply open the DML folder and right-click over the DML.exe file. To uninstall DML, simply delete the main DML folder. All files are stored here so this will completely remove DML from your system. Using the installer may be an easier option for some people. It also gives you the option to create a desktop and start menu shortcut. Double-click the install file (dmlInstall.exe). This will start the install routine. Follow the instructions on the installer. 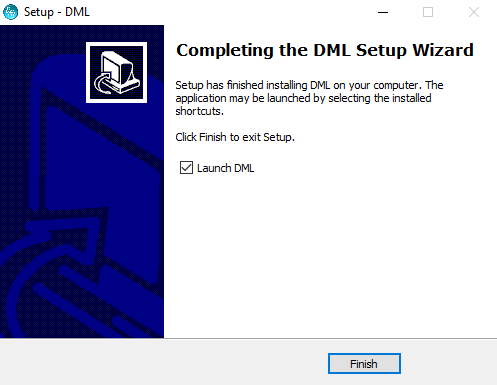 This will install DML to the specified location on your PC. An uninstaller is not provided with this installation. The installer setup routine is shown below step by step. Step 1: Accept the agreement to continue. 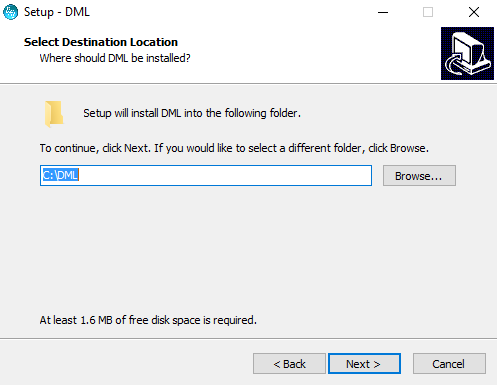 Step 2: Select the location that you want to install the DML folder to. Step 3: Select where you want the shortcuts created. This option defines whether a shortcut will be created in the start menu. If DML is being installed to an external hard drive or thumb drive, it is probably best not to create a shortcut here. In this case click the "Don't create a Start Menu folder" checkbox. Step 4: Select whether to create a shortcut on the desktop. Step 5: This is a confirmation of your selections before installing DML. The image above left shows where DML will be installed and that no shortcuts will be created. The image below shows where DML will be installed and that a desktop shortcut will be created. Step 6: If you want DML to start after this installation, click the "Launch DML" checkbox. Click "Finish" to complete the installation. 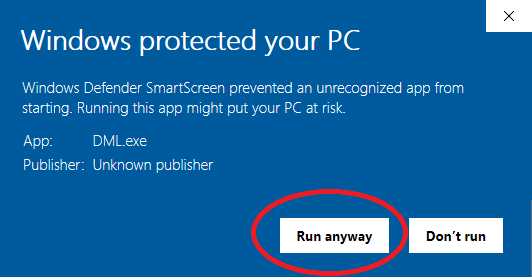 Note: On Windows 10, when you first start DML, Windows may intervene with a Windows Smart Screen "Unrecognised Application" warning. If this is the case, click on "More Info" as circled in the image below. Then click on "Run Anyway" as circled in the image below. If this does happen, it will only happen the first time you launch DML. After this, Windows will recognise the app. 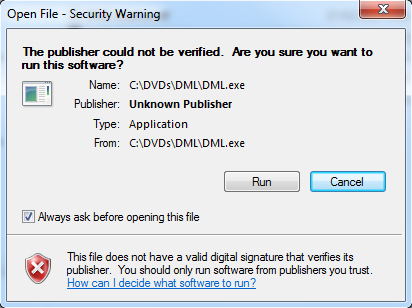 Note: On Windows 7, when you first start DML, Windows may intervene with a "Publisher could not be verified" security warning. If this is the case, click on "Run". To stop this from showing everytime you start DML, deselect (no tick) the checkbox "Always ask before opening this file". 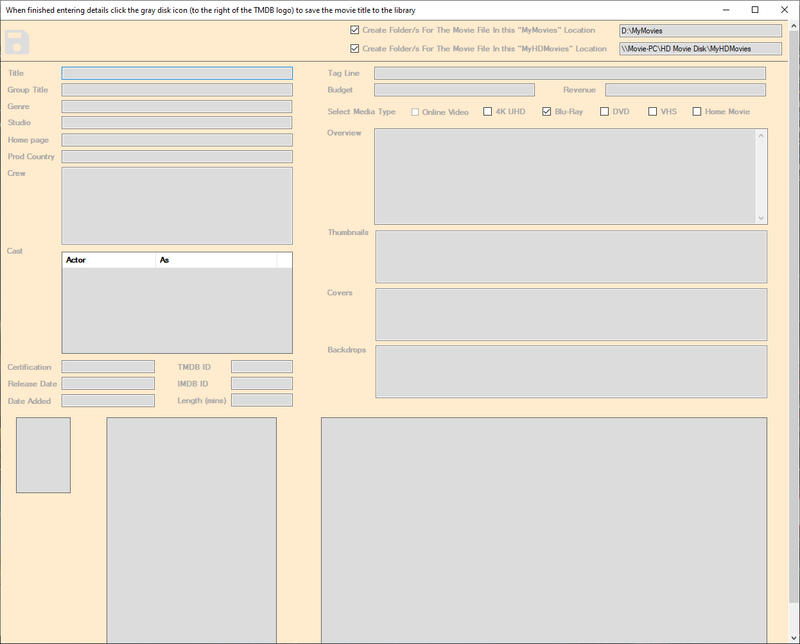 This is the most efficient way of entering movie titles as you have the ability to change input and choose images etc. To download a single movie title, right-click on the top information bar. The context menu shown in the image below will appear. You need an internet connection to be able to use this function. 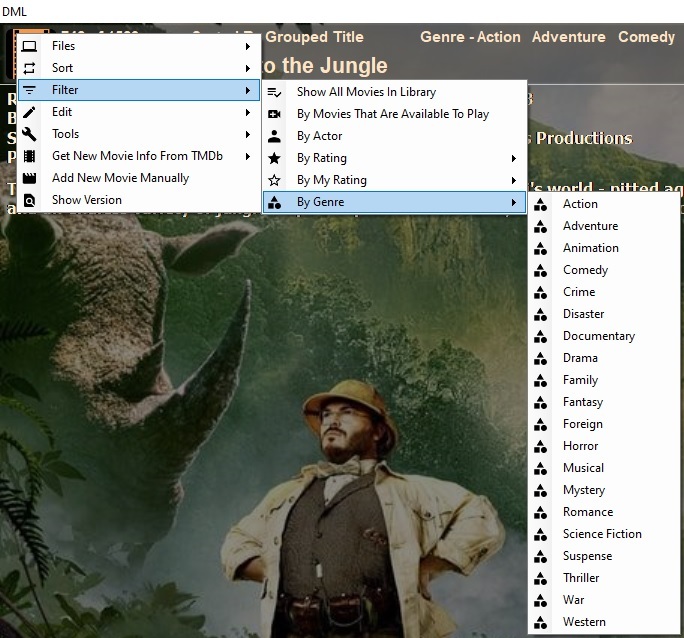 Then select Add New Movie Title To Library as shown in the image above. If you want DML to create folders for your movie files (if you have them available for the movie title you are searching for) set the check boxes to create the folders and enter the location of the "MyMovies" or "MyHDMovies" folder to create them in - as shown in the image above. As seen in the image above, you can set DML to create these folders in both local and network drives. If you have a DVD, Blu-ray, or 4K UHD disk for the title you are downloading you can set the disk type for the title here by selecting the appropriate checkbox. 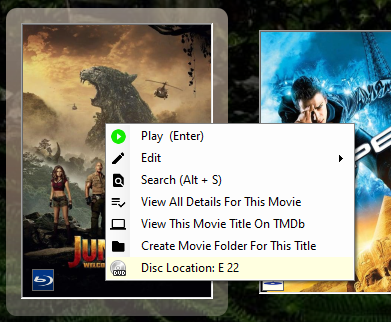 The disk type can easily be set later by selecting the movie title and right clicking menu option "Edit > Set Movie Disk Type"
Click the "Powered By The Movie DB" logo  to start the search for the movie title information. If TMDb has multiple results for the title you have searched for, the window shown in the image below will appear. Most of the time you will find your movie title on the first page of 20 titles returned, if it doesn't appear there, click the arrows at the top right of the page to navigate to another page. 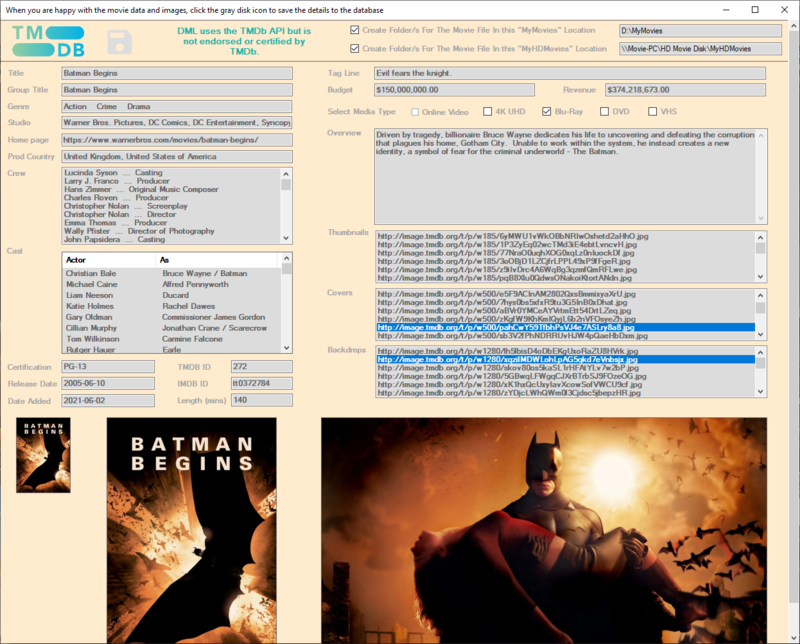 Click on the image for the title you want and DML will download the information to the window as shown below for the title "Batman Begins". If there is only one title available, that information will download straight to the page as shown above. You can now either accept the information and images shown, or edit them to your preference. To edit the text in the cast or crew lists, double-click the line to be edited. To change any of the thumbnail, cover, or background/backdrop images, select a line in the list and it will download and display that image. The image shown above displays the second image in the list as selected for the thumbnail and cover images, the backdrop has been changed to the fourth image in the Backdrop list. Changing the cover image in the list will also change the thumbnail image. DML for Windows does not use the thumbnail image, it is stored for the creation of DMLMobile files for the mobile version of DML. If you wish to use a thumbnail image for your mobile version that is different to the cover image, simply select the image in the thumbnail list after you have selected the cover image. To save the movie details to the library, simply click on the movie reel logo  next to the TMDb logo. Done, the movie title will now be entered into the library. You can add multiple movies to your library by creating a text file of the movie titles. One title per row as per the example below. If you have backed up your discs to file and placed the files in a single folder, and the files are named as the movie title, as per the example below, then DML can create a text file for you using the filenames. 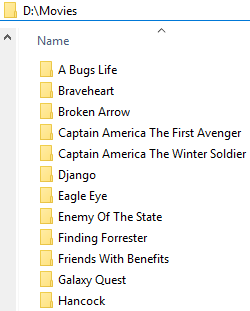 If you have backed up your discs and placed the movie files in their own folders, and the folders are named as the movie titles as per the example below, then DML can create a text file for you using the folder names. When you start DML for the first time it will be a blank database. 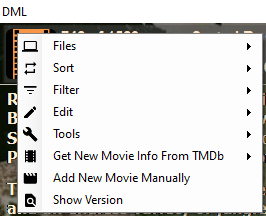 Right click on the top section of the screen and select menu option “Get New Movie Info From TMDb > Add Multiple Titles To Library” as shown in the example below. If you just want to start manually entering movie titles, select “Add New Movie Title To Library” instead. This is slower, but it is the most efficient way of entering movie titles as you have the ability to change input and choose images etc. See Download a single movie title. You will need a text file containing the names of the movie titles you want to load to use this operation. Create your file as per the example shown on the page above - one movie title per line. Or, if you have movie backup files of your DVD, Blu-ray, or 4K UHD discs, use the file or folder names to create your text file. Select “Start Downloading Movie Titles” to start the operation. This operation will download and save the details for each movie title that has been found. If multiple results are found for the search title, the first one in the returned list will be used. We have found that in 95% of our tests, the title returned is the one we were looking for. If a title has not been found it will be added to a list which will be loaded into a text file when the operation completes so that you will be able to go through and check the spelling or naming of the titles to figure out why it was not recognized by TMDb. This operation is the fastest way to load your movie library but it does not allow for choosing images or editing any of the text fields returned. This can be done later once the download has completed. Simply right click on a movie title and select "Edit > Edit Movie Details" from the context menu. This will open the edit window where you will be able to change thumbnail, cover, and backdrop images as well as edit any of the text fields. When 'Add Titles Using Mobile ID File' is selected (as shown above), a file open dialog will activate for you to select the file to load. This must be a text file that was generated by a DMLMobile app. The file will be named "DMLMobileForWinCreation_" followed by the number of titles it contains. 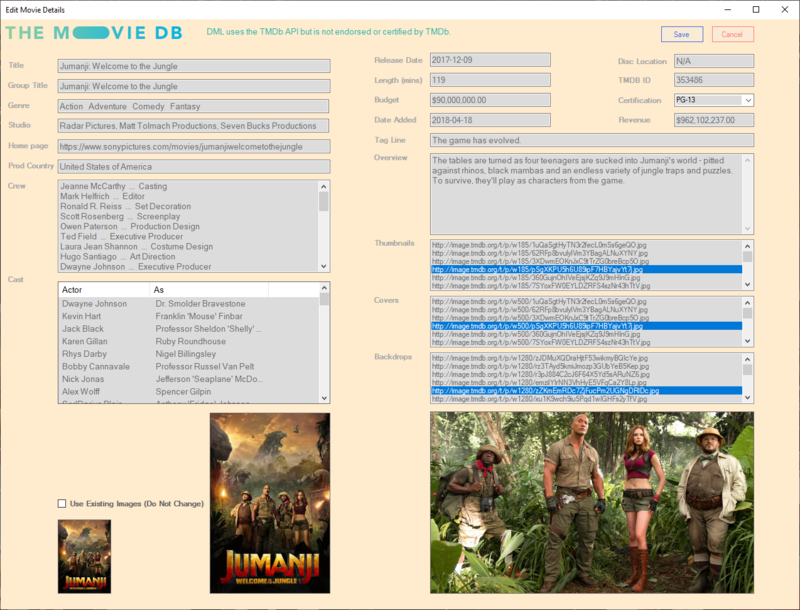 Once you have selected the correct file, DML will iterate through each row in the file and use the TMDb ID to download that movie title from the TMDb.org website (https://www.themoviedb.org/) and add it to your library. To navigate through the library you can use the mouse, the keyboard, or the arrow controls to the right of the visible movie row, or rows. Place the mouse over a movie title displayed in the visible row or rows and the movie will be selected/highlighted and it's details displayed on screen. Use the scroll wheel on the mouse to scroll up or down rows of movie titles. If one row is displayed, the rows will increment or decrement by one row per scroll click. If two rows are displayed, the rows will increment or decrement by two. Use the up, down, left, and right arrows on the keyboard to navigate up, down, left, and right through the movie titles. When at the end of a row and the right arrow is pressed, the row will increment and the selected movie will be returned to the first title in the new row. When at the start of a row and the left arrow is pressed, the row will decrement and the selected movie will be returned to the last title in the new row. Use the Tab key to navigate to the right, or Shift + Tab to navigate left. Use the Home key to navigate to the first row in the library. Use the End key to navigate to the last row in the library. Pressing any of the alpha keys will take you to that point in the library. I.e. pressing the 's' key will take you to the start of movie titles beginning with 's', pressing 'g' will take you to the start of movie titles beginning with 'g' etc. If no movies begin with the pressed letter, DML will not do anything. Pressing Alt + s will open the window shown below. Type in The whole title, and the search will take you to that title in the library, or just type the start of the title, i.e. "The Hun" (for The Hunger Games) and the search should take you either straight to, or close to that title - depending on what other titles you have that start with "The Hun" of course. 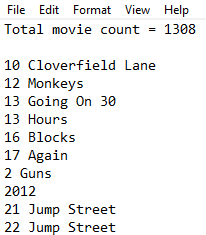 to increment or decrement through the rows of movie titles. 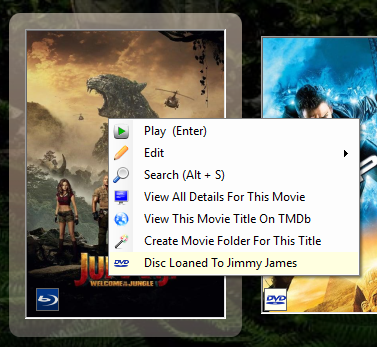 The button highlighted in blue in the image below displays the DVD/movie library window. The button highlighted in yellow in the image below displays the cd/music library window. The 3rd button from the left - with the bar, lowers the DML window to the task bar. The 4th button from the left resizes the screen to "normal display size" (1230px x 675px) so that it can be dragged around and positioned wherever you want it. Clicking the button again will maximise the display again. The right most button - with the X, closes the application. Accessed by Right - Clicking anywhere in the top information bar. This copies the cover image from the library folder into the selected movie folders (MyHDMovies or MyMovies). This image will then show up on the folder when viewed in Explorer and also in many media players when viewing available movie files. This creates a text file showing all movies that are in the library. This function was originally envisaged for users to be able to carry an updated copy of one of these files on their phones for when shopping for new DVD, Blu-ray, or 4K UHD movies so that they don't double up and buy ones they already have. Nowdays users can download the free mobile library for Android phones and transfer/update the mobile library from their Windows DML app. This makes checking for movies much faster and easier with the search function that comes with the mobile app. There is also a paid version of the mobile app that interacts with TMDb to allow users to download new titles directly to their mobile library as well as accepting update files from the Windows version. But, if all you want to do with a mobile library is carry it with you and use the search function. And, you don't mind doing all your additions and edits on the Windows app before transferring the update file to your phone, then the free version is ideal for you. See more on the free version. 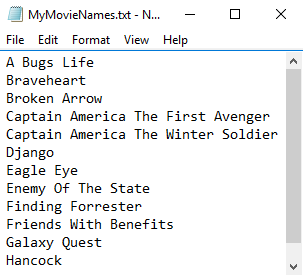 The lists in the text files are alphabetically sorted from A - Z and can be just the movie titles, or include the following options. If there are 5 or less movie titles that do not have a movie file associated with them this will show them as seen below. If there are more than 5 titles you will be prompted with a save file dialog to save the list as a text file. Creates a text file of movie titles that have more than one movie file available. This menu option creates a report showing all movies out on loan as shown below. 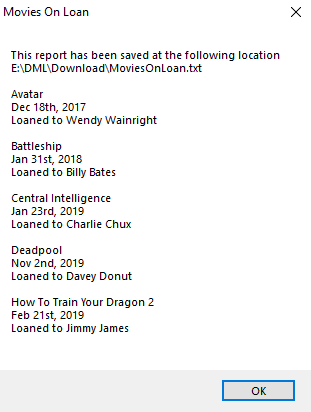 As you can see from the example above, the report is also created as a text file called MoviesOnLoan.txt and is saved in the Download folder inside your DML folder. If no files are on loan, the message will simply display as below. This menu option opens the window shown below. The first option 'Output All Movies To DMLMobileFiles' will create output files for your whole collection. Due to some older phones having issues with large files, the total amount of movie titles per file will be 500. This will create a file of approximately 10MB in size. All files are saved in your DML folder at \DML\DataFiles\DML_Mobile\ A message will display once the files are created telling you the exact location. The second option 'Output Updates From The Last 30 Days' will create an update file containing only the movie titles that have been edited or added in the last 30 days. 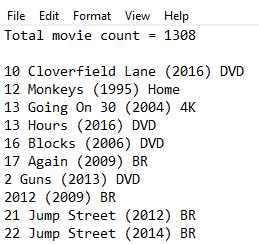 The file will be named in the format of 'DMLMobileMovies_Update1To12.txt' the 1To12 in the filename signifies 12 movie titles are contained in the file so this will change depending on the number of movies that have been updated or added. The third option 'Output Updates From The Selected Date' will create an update file containing only the movie titles that have been edited or added since the date selected in the date picker to the right of the button. As it implies, It sorts the library by Title in an ascending alphabetical order. Sorts the library by Title in an ascending alphabetical order, but ignores the word 'The' if it is found at the start of the title. I.e. "The Hunger Games" would be sorted as "Hunger Games" and would be found amongst the movies starting with "H". As it implies, It sorts the library by Title in an descending alphabetical order. Sorts the library by the movie release date. Most recent date to oldest. Sorts the library by the movie release date. Oldest date to most recent. Sorts the library by the date the movie was added to the library. Most recent date to oldest. Loads all movie titles that currently have movie files available to play. This opens a window (shown below) where you enter an actor's name and then DML runs a query on movie titles that have that name in any of the cast/actors fields. The result will only display movie titles that feature the queried actor's name. Filters the library by censor rating. PG will show only movie titles with a rating of PG. PGR will show movie titles with a rating of PG 13 and PG. R will show only movies with an R rating. Filters the library by the specified user rating. This can be a real time saver when you have a large library, it allows you to filter out movies that you are not interested in watching ... at this point in time. Filter by two ticks will show movie titles in the library that have two ticks or more. Filters the library by genre type. This opens the "config" window for editing as shown below. If you want to define specific hard drives or mapped network drives to use with the app, do so here and de-select the Auto Select checkbox. When Auto Select is selected, DML ignores the specified HDD's and scans through all attached drives. The mapped drives will still be searched. This is the recommended option. When mapping drives, map them right to the "MyMovies" or "MyHDMoviess" folders so they go straight to the movie file folders. This is where you define what file formats you use for your movie/video files. There are 5 types allowed which should be plenty for anyone as most people will stick to any one format. On the right of this section, you define what type of file should be played - HD Movie / DVD or Standard Movie by telling DML what folder to look in for the files. DML will only look in whatever folders you define here. I.e. DML will only look in the MyHDMovies folders when searching for files to play if you have checked "MyHDMovies" and will only look in the "MyMovies" folders if "MyMovies" is checked. This is so that you can set your system to automatically play the higher definition (but larger file size) HD movie or DVD files on larger screens, or set to automatically play the smaller movie files when playing on smaller screens. Specify whether your movie files are stored together in a single folder or stored in separate folders by checking one of the two checkboxes “My movie files are in separate folders” or “My movie files are stored together in a folder”. This is where you define what colour to use for the screen text that appears across the background images. I defined this to help alleviate the problem I was seeing with text colours "bleeding" or aliasing when you had a dark background with a light text colour overlaid. When you download the background image, DML performs a colour check on the background image to see how dark the colours are - on average - and applies a value to the image which is then used to determine which of the colours you define here to use to display the text on the screen. There are 5 types allowed but I have found that using 3, as in the image above, is pretty much spot on - for my tastes anyway. This option adjusts the opacity of the background image to make the screen text more readable. The darker the opacity, the easier it is to read the text. This opens the "Genre Types" window for editing as shown below. This opens the "Movie Info Downloads" window for editing as shown below. These functions allow you to update a library from a master library without downloading the movie title details again. For instance, if you store your movie files on your Study computer and update that DML instance with the new titles, you would use this tool to update your movie computer or any other computer that you run DML on as well. All you need to do is specify where the master DML folder is and click the update button. This will keep all instances of DML current and consistent with the same info and images. 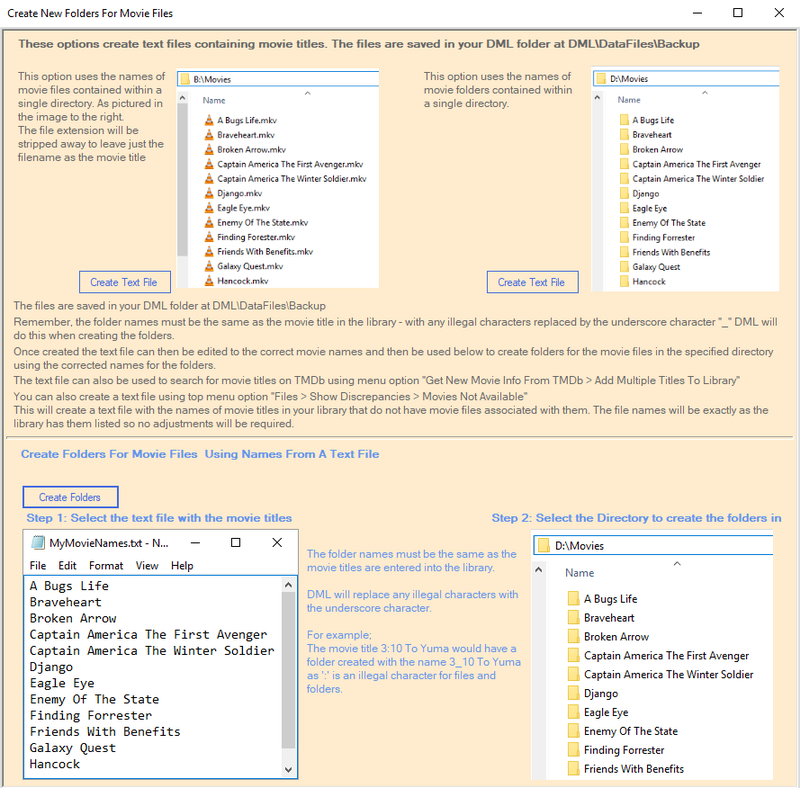 Like the DML options that use filenames or text files to define movie titles to download movie info from TMDb, this uses the folder names in your existing "MyHDMovies" or "MyMovies" folders to obtain movie details from an existing DML application. This option will only retrieve data for movie titles that exist both in the existing DML app and as a folder name specified using this option. This option is used to update your rating of movies, and movie disk types, on, or from the master DML location. I.E. if you have updated the ratings of movies you have watched on the movie PC and want the same ratings to be kept in the master location, click "Update the master DML location from this library". This will copy all ratings and disk types from all movies on the Movie PC to the master DML location. If you want to update the ratings from the master location to any other library, click the first button "Update this library from the master DML location". This will copy all ratings and disk types from all movies in the master to the location you are updating from. 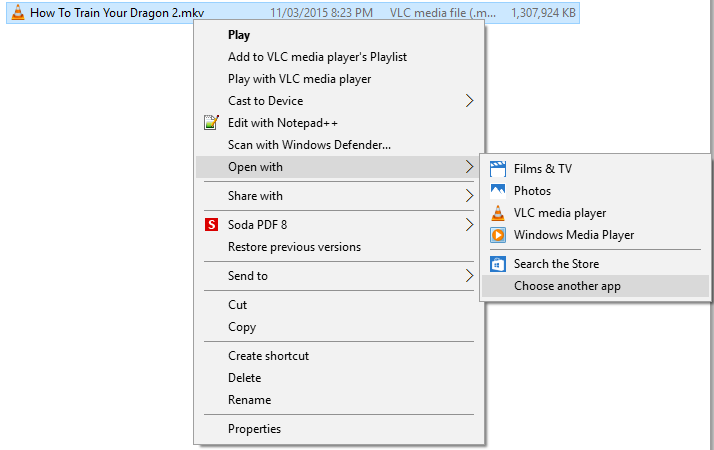 This option causes DML to search all hard drives for movie folders and the video or DVD files they contain and update DML with their availability to the movie titles. Use this option when a particular movie file does not show as being available. If this does not work, try restarting DML. If that doesn't work, check your Naming Conventions for folder and file names. This opens the "Create New Folders For Movie Files" window as shown below. This option is meant for when you setup DML from new. This allows you to use a text file containing movie titles to create folders for you to place your movie files in so that DML can find them to play. The text file can be created above from either using movie file names, or folder names. Just click the 'Create Text File' button to create the file. These two options will iterate through the folder containing the movie files or folders and create a list of the filenames (minus the file extension) or folder names - and save it as a text file. You can then edit the filenames in the text file to accurately reflect the movie title, and then use this file with the next option (Create Folders). Clicking the 'Create Folders' button will open an Open File Dialog for you to select your text file to use. Next an Open Folder Dialog will open and ask you to select the folder to create the movie folders in. To comply with DML naming conventions so that the movie files can be found, this should be either'MyMovies' or 'MyHDMovies'. Once selected, DML will iterate through the text file creating the folders. If the movie titles contain any illegal characters (for files or folders), DML will replace them with an underscore character. For example, the movie title '3:10 To Yuma' would have a folder created as '3_10 To Yuma'. DML will be able to find any folders it renames like this. 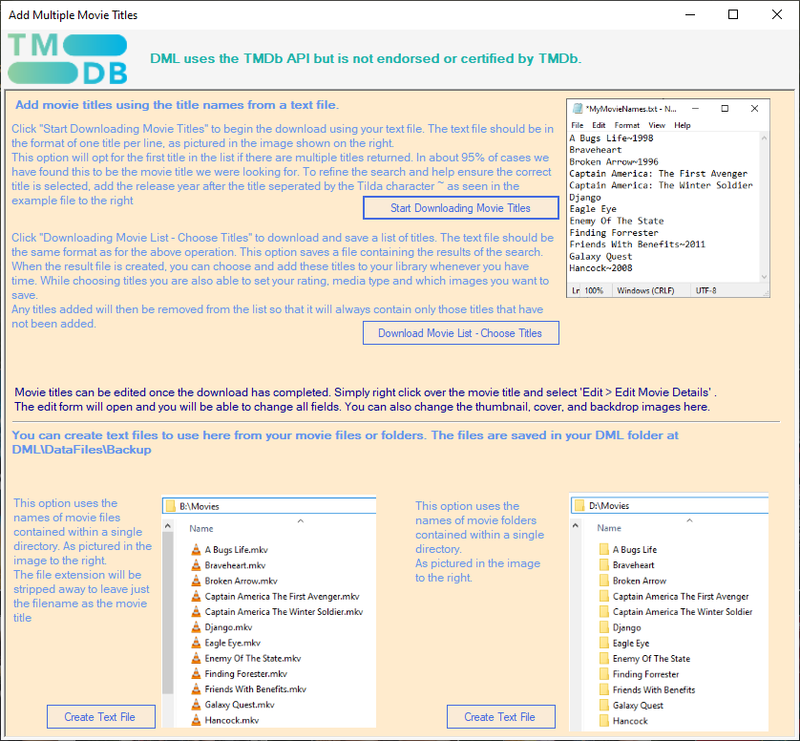 This text file can also be used to download multiple movie titles from TMDb using the menu option Get New Movie Info From TMDb > Add Multiple Titles To Library. Or you can use menu option "Files > Show Discrepancies > Movies Not Available" (as long as there were more than 6 titles not available that is). 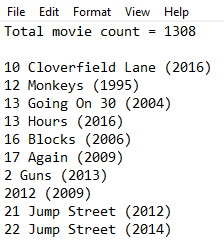 This is a DML created file using the library movie titles that do not have associated movie files. The names will be correct and this file can be used to create movie folders without the need to edit anything. If you have 6 or less titles missing, then you will have to create the text file manually entering each movie title on a new line as per the text file example in the image above. Go to Download Multiple Movie Titles for more on this. 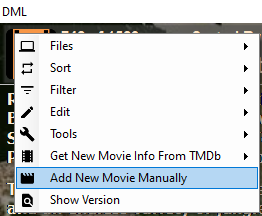 This option retrieves movie data from the TMDb website for a single movie title. For more on this option, see Download Movie Info. This option was designed for use when starting a new library. It retrieves movie data from the TMDb website for multiple movie titles. For more on this option, see Download Multiple Movie Titles. This will open the window shown below. This is the same window that is used to load movies from TMDb but without the TMDb option. All fields need to be manually filled out. Crew and cast are added by double-clicking on the list and entering the data. For the cast, the actors name must be separated from the person they are acting as. The text 'as' or the comma both act as separators in this field. The context menu option shown in the image above is valid for all three images ... thumbnail(185x278px), cover(500x750px), and backdrop(1280x720px). The first option 'Paste Image / Image URL' will paste a file that has been copied to the clipboard, or download a file from a url that was copied to the clipboard. The second option 'Add Image From File' will open a File Open Dialog in which you choose an image file to insert into the corresponding image container. Note the disc formats available. when downloading from TMDb, you have the option of 4kUHD, Blu-ray, or DVD disc types. Here you also have the option of adding Home Movies to allow for your own creations. As explained in the title bar of this window, when you have finished entering the details you want, click the movie reel logo at the top left of the window to add the movie title to the library. This menu option will open up the window shown below. 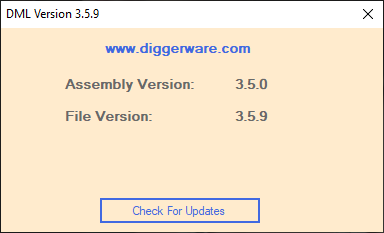 It displays the file version of your DML application and allows you to check for, and install updates. Accessed by Right - Clicking anywhere in the main screen (over the background image). As it suggests, this option allows you to select the font size to use on the screen display. This option allows you to hide the text from the on the screen display. Once hidden, this menu option will read "Show Text" and will restore the text when clicked. This option allows you to hide the controls and text from the on the screen display so that the background image can be clearly seen. To view the controls and text again, click anywhere on the screen. This option will display two rows of movie titles. The number of titles displayed per row depends on the size of your display, higher resolution screens will display more titles than lower res screens. Once two rows have been selected, this menu option will read "Display 1 Row Of Movie Titles" and will revert the display to showing one row when clicked. Accessed by Right - Clicking on the selected movie title (Cover Image). As it suggests, this option will start the media app you have attributed to your video files and play the selected movie (or you could just press enter). This option allows you to rate individual movies once they have been watched. The default value when the movie title is entered into the library is "Not Viewed". To change rating values for all movie titles in your library use the bottom menu option " Set Rating For All Movies". This gives you the same rating options to set, but it changes the ratings of all movie titles in the library, not just the selected title. This option will open the editing window shown below. The images that are displayed when this window opens are not necessarily the images that the library is displaying currently - they are the first images in the list. If you want to keep the images currently displayed in the library, check the "Use Existing Images (Do Not Change)" checkbox at the bottom left of the window, otherwise the images displayed on the edit form will replace the existing images. If you want to change the images, click through the "Thumbnails", "Covers", and "Backdrops" lists until you see the image you want. Uncheck the "Use Existing Images (Do Not Change)" checkbox at the bottom left of the window for the changes to take effect when you click the save button. To change the text in the crew or cast lists, double-click the entry you want to change. A small text field will appear over the entry for editing. All other text fields can be edited as they are. If you change the movie title and you have a movie file for that title, make sure the hard drive it is on is connected and DML will find it and rename the video file folder to reflect the new title. When you are done, click the "Save" button at the top right of the window. This will delete the selected movie title from your library. This option will set the movie disk type to either DVD, Blu-ray, 4K UHD, or Home Movie. This will display the DVD, Blu-ray, 4K UHD, or Home Movie logo on the movie tiles if there is a file available to play for that title. You can also set the disk type when downloading the movie titles from TMDb by selecting the appropriate checkbox. This will open the search window shown below. Enter the movie title, or part of the movie title and click the "Search" button. 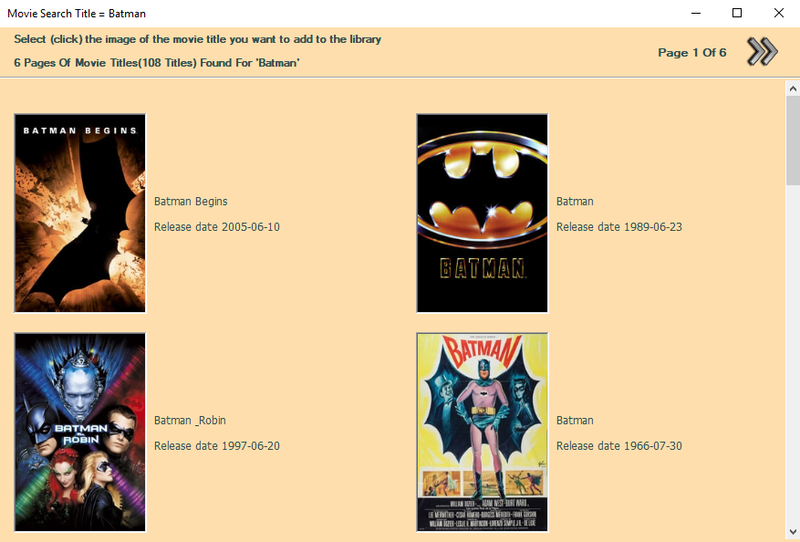 If the movie title is in the library, DML will navigate to, and display the movie title. Using this menu option will display all details that have been saved for this movie title. The display shows all actors and crew members. 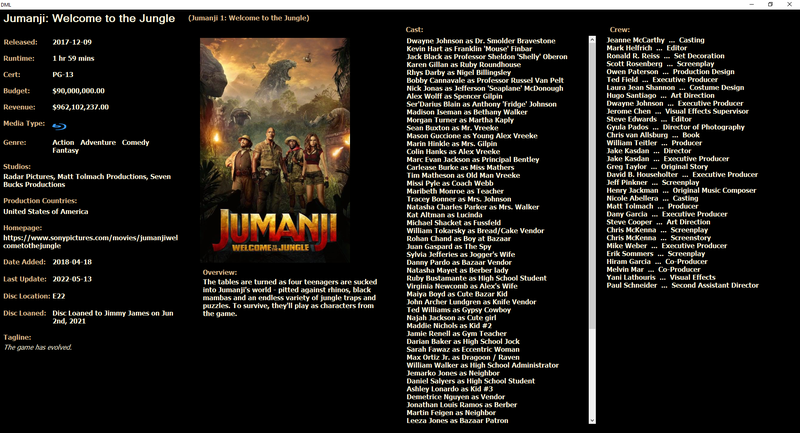 If there are too many for the display, the list will scroll as shown below for the actors list (Cast). Additional fields that are not shown on the main display, other than crew, are the date the title was added to the library, the date the title was last updated, the location of your disc (if you have specified this), and whether the disc is loaned or not. If the disc is currently on loan, the display will show who it is loaned to and the date it was loaned. Using this menu option will take you to the selected movie on the TMDb website so that you can view the available details about the movie that DML does not store. If you haven’t created a folder when adding a title, selecting “Create Movie Folder For This Title” will use the selected movie title to create the folder or folders to put the movie files in. Any illegal characters found in the movie title will be replaced with an underscore when creating the folder. The location these folders are created in will be the MyMovies, or MyHDMovies folders specified in the Add Movies window shown below. To set these folders, open this window with the top context menu option Get New Movie Info From TMDb > Add New Movie Title To Library The folder locations are saved each time you close this window. This will open the Edit Disc Location window shown below. 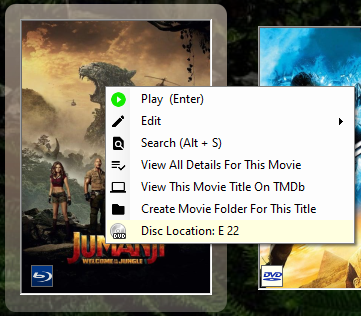 Enter the location of your movie disc. This would be where your disc is stored, i.e. shelf D 23rd disc along, or box D 23rd disc from bottom left – however you store your discs. As long as you understand your storage system, it doesn’t matter how you name your locations. 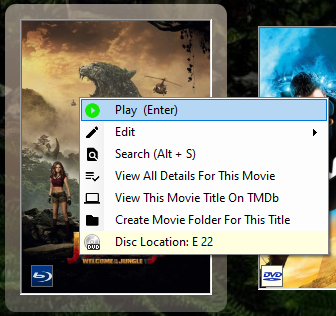 If a disc location is specified as above, the Selected Movie Menu will no longer display "Add Disc Location", it will display "Disc Location:" and the location you have entered - as shown below. Clicking the menu will have the same effect - it will open the Edit Disc Location window. 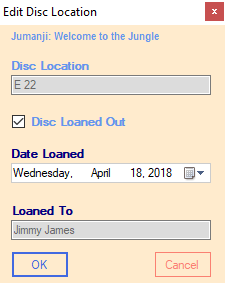 You can set the disc as "On Loan" and enter the name of the person that you loaned it to. 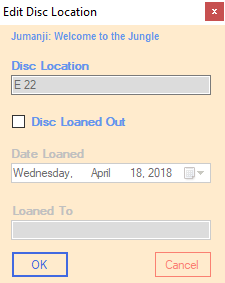 If the disc is specified as loaned out as above, the Selected Movie Menu will no longer display the location, it will display who it is loaned out to as in the image below. 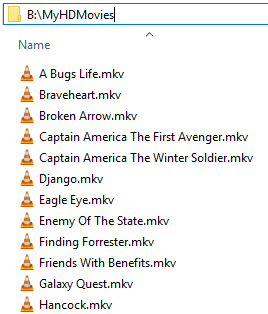 If you plan to use DML to start playing your backup files, you must rename the folder containing the backup files to either "MyMovies" (for standard files) or "MyHDMovies" (for High Def movie files). These folders should be created, or placed in the root of whatever hard drive you want them in. These can be internal or external drives. For example – C:\MyMovies, or F:\MyHDMovies etc. For more on naming conventions, see the next section (Naming Conventions). The movie filename or folder name (depending on your setup preference) must match the movie title you have entered in your library. If you have specified that all your movie files are in one folder, DML searches the specified folder (MyMovies or MYHDMovies) for a file named the same as the selected movie title. If you have specified that your movie files are stored in seperate folders, DML searches the specified folder (MyMovies or MYHDMovies) for a folder named the same as the selected movie title. Once your movies are loaded check your parameter setup by selecting “Edit > Config” from the top context menu. If your movie files are all in one folder, select the “My movie files are stored together in a folder” checkbox shown in the image above. If your movie files are stored in separate folders select the “My movie files are in separate folders” checkbox option shown in the image above. The other thing to do here is tell DML whether you are using high def or standard files. Do this by selecting the folder name that you renamed your movie folder to. Either MyMovies or MyHDMovies. Specify what file formats you want to use, you can select up to 5. The defaults that are pre-set are shown above (mkv, avi, mov, mpg, mp4). If you only use DVD folders (VIDEO_TS) with .vob files, then just make sure you specify and name your movie folder as “MyHDMovies”. Because the full DVD files are as large (depending on the quality of your backup files) as the HD (1920 x 1080 px) .mkv or .avi files, they are stored with the high def files leaving the "MyMovies" folder for the smaller files. Click the save button in this section to save your choices. 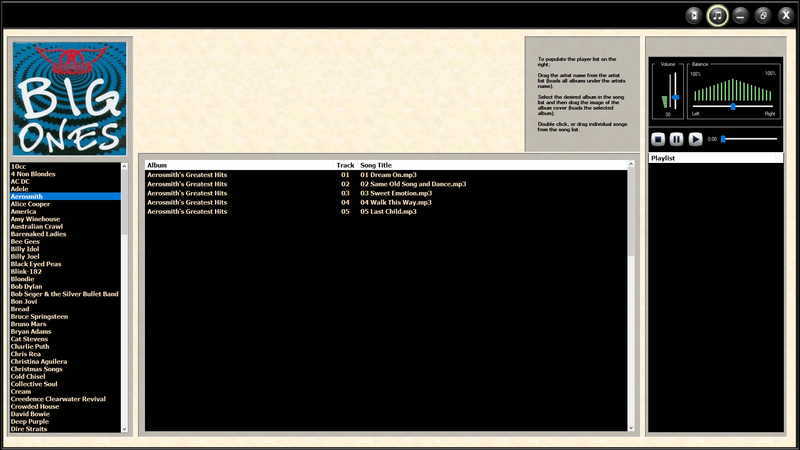 Restart DML and it should now find your movie files and be ready to initiate playing them from the library. 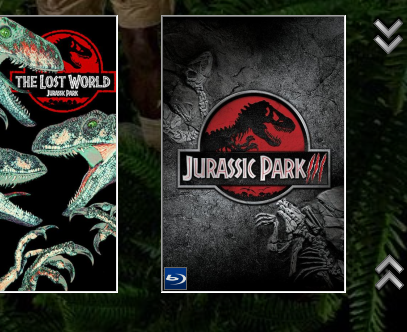 If the files are where they should be and the folder and files named correctly you will see either a DVD, Blu-ray, or 4kUHD logo (depending on whatever disc type you have set for the movie title) in the bottom left corner of the cover image of each movie title in your library – as shown in the image below. If there is no logo showing on a movie, there is either no movie file available, or the file or folder has been named differently to the movie title that was entered into the library. If your movies are all in either the “MyMovie” or “MyHDMovie” folder, the movie filename must be the same as the title in the library. If your movies are stored in separate folders in the “MyHDMovie” folder, the folder that contains the movie file must be named the same as the title that was entered into the library. In this situation the actual file can be named anything you want. It can also be either a single movie file such as mkv, avi etc. Or, it can contain a VIDEO_TS folder with all of the .vob files from a DVD. One of the problems these apps can have is the fact that if you plug a hard drive into a different port and it assigns the drive with a new drive letter, the app will not find the existing movies and in some cases, start to re-acquire the whole library. So, to remedy this, DML does not automatically acquire data for existing movie files when you start the app. It also uses certain naming conventions or rules to define where the movie files you have are stored. These directories/folders need to be created in the root of whatever drive they are stored on. I.e. C:\MyHDMovies, C:\MyMovies, E:\MyHDMovies, E:\MyMovies etc. 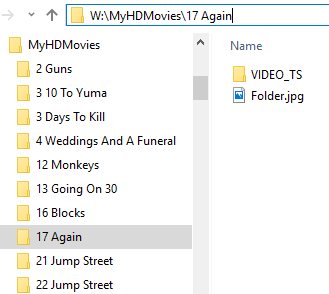 The example below shows the MyHDMovies folder for the movie title"17 Again" at the location W:\MyHDMovies\17 Again. Create the folder and name it the same as the title of the movie as it is entered into the library. Any illegal characters must be replaced with the underscore character ‘_’. I.e for the movie title “Jumanji: Welcome To The Jungle” you would name the folder “Jumanji_ Welcome To The Jungle”. Illegal characters for files and folders are “ [ \ / : * ? "" < > | ] ”. 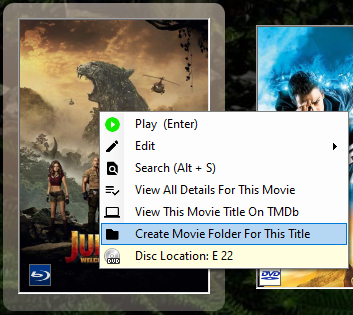 These folders can be automatically created for you when downloading the movie information from TMDb by checking the "Create Folder/s For Movie File In One Of The Specified Drives" and/or "Create Folder/s For HD / DVD File In One Of The Specified Drives" check boxes and then select the appropriate MyMovies or MyHDMovies folder to create the new folder in. DML will use the movie title you are downloading the information for to create the folder or folders to put the movie files in. Any illegal characters found in the movie title will be replaced with an underscore when creating the folder. If you haven’t created a folder when adding a title, you can still have DML create a folder for you by right clicking on the selected movie tile and selecting “Create Movie Folder For This Title” from the context menu as shown below. It is important that the naming is correct here as DML searches the MyHDMovie and MyMovie folders on all hard drives for a folder or file named the same as the selected movie title. If the folder or file has not been named correctly, the movie file will not be found and therefore will not be available to play from within DML. Once the folder has been created and named, simply drop the "VIDEO_TS" folder containing all of the DVD .vob, .bup, and .ifo files into it as seen in the example images above and below. 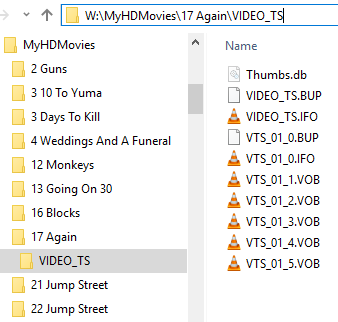 If you use a higher resolution movie file format such as backup files from bluRay, mkv h.264 or mkv or mp4 passthrough, you can drop the movie file in here instead of the VIDEO_TS folder (as seen in the image below for the movie 21 Jump Street) and DML will find and play the file (as long as the file extension is defined in the config settings - see menu option Edit > Config). If you only use movie files such as mkv or avi and would rather have your files all together in one folder, use menu option “Edit > Config” to open the edit parameters window and select the “My movie files are stored together in a folder” checkbox. Click the save button in this section to save the change. Then just rename the folder you have them stored in as either “MyMovies” or MyHDMovies” and make sure it is in the “root” of whatever drive it is stored on (C:\MyMovies, C:\MyHDMovies, D:\MyMovies etc). When using this option, the movie titles in your library must be named the same as the movie files in your “MyMovies” or “MyHDMovies” folder as shown in the example below. The reason behind using the separate MyHDMovies and MyMovies folders (other than ensuring DML can always quickly find these files if they exist) is to allow you to set the system to play the higher or lower resolution files depending on what display you are using. For instance, when travelling you would probably not be able to carry all of your higher definition movie files with you because of file sizes and available portable storage, so in this case it would be best to use the smaller lower definition files. And of course, when playing on the big screen at home, you want the best image quality you can store and play, so using the HD files is best here. Placing the files in the specified folders like this allows you to tell DML what type of files to look for and play. 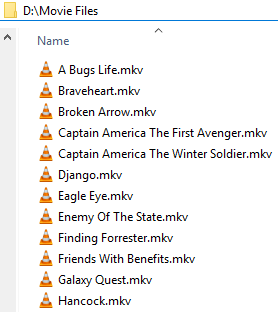 The nice thing about having your files in separate folders is that you can use DML to create a folder.jpg file in each movie folder so that when you view the folders in Windows Explorer, or most media players, the image will show on the folder making it easier to recognise the movie. If your movies are all stored in one folder and you would like them to be put into separate folders, DML can do this for you. See how to create folders. 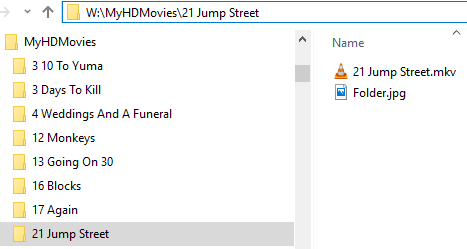 For the smaller movie files, use the same naming conventions but just drop the movie file straight into the movie folder as in the example below for the movie title "2 Guns". Or as shown above, put all of your movie files in the “MyMovies" folder. For music files, use "MyMusic" as the main folder name and place it in the root of whatever hard drive it is to be stored on i.e. D:\MyMusic, E:\MyMusic etc. The image below shows the "MyMusic" directory as "B:\MyMusic". As you can see from the image above, the folders are structured as MyMusic > Artist > Album > Songs. If you use Windows Media Player to rip your cd's, it will place them in this format and save the album art as seen in the image above. All you need to do then is copy / move the album folder from the MyMusic directory that Windows Media Player places them in to the MyMusic\Artist folder. If you do not already have the artist in your library, simply copy the Artist folder (containing the newly ripped album) that Win Media Player created and paste that into "MyMusic". DML looks for the text "_Large" in the album art filename to determine which of the images to display. 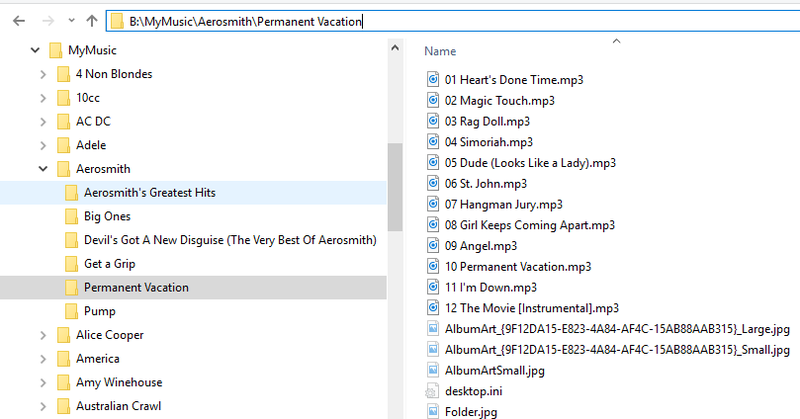 Win Media Player names the album art files with this - as you can see in the image above showing the album art in the right pane underneath the mp3 files. If you are using your own image, add "_Large" to the filename to ensure DML knows to use it. For example, you would use something like "Aerosmith_Pump_Large.jpg" for your own album art for the album "Pump" by Aerosmith. DML does not actually play the movie files, the application (media player) that you have associated with the files plays them. DML just passes the instruction of which file to execute. If your system does not know what to do with the file when you try playing it from DML, you will need to associate the file type with the media playing application you are using. There are two ways in which to start a movie playing. 1: Right-click on the selected movie and select Play from the context menu. 2: When the desired movie has been selected, press the enter key. Once the movie has started to play, use the keyboard shortcuts that are part of your media playing application to control the way the movie is played, paused etc. If the triangle in the icon is green (as in the image above), then the movie is available and will play. If it is gray, the movie file is not available, or has not been identified by DML. The DVD or Blu-ray logo visible in the bottom left corner of the movie title images shown above - will also not be visible if the file is not available. The most common cause of files not being available is that the hard drive containing your movie files was not connected when DML was started. If this was the case, tell DML to update file availability by selecting from the top menu Tools > Update Movie File Availability. This tells DML to run a search on the MyMovies and MyHDMovies folders on all connected drives and update their availability. DML also runs a search on the MyMovies and MyHDMovies folders on all connected drives each time it is started, so restarting DML will have the same effect as executing the above menu option. Check that you have the correct file type set for the movie files you are using (Top Menu - Edit > Config). I.e. if you have "MyHDMovies" set, DML will only look in the MyHDMovies folders for your movie files. If you have "MyMovies" set, DML will only look in the "MyMovies" folders for your files. Check Naming Conventions for the movie folder. Normally when you install an application it will ask to be associated with a set of file types. 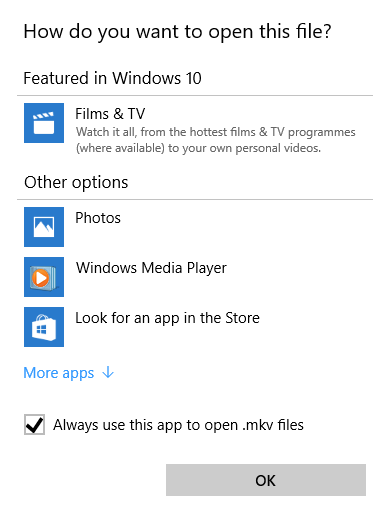 Right-click on the movie file and select Open With > Choose Another App as in the below image. Check the option at the bottom of this window (as in the image above) to "Always use this app to open ..."
The file type should now be "associated" with the chosen application. This was just created on a whim originally, but I have found that I use it so much I thought I might as well leave it in as part of the DML package. Accessed by clicking on the music button found at the top right of the screen. Shown highlighted in yellow in the image below. Click on the desired artist in the "Artist List" (left most list). The artist's albums will be loaded into the "Album List" (middle list). When a song is selected in the album list, that album cover is displayed in the left top album display. As seen in the image above. If no songs are selected, DML will display the first album cover in the list. To load individual songs, either double-click the song in the album list, or drag it into the playlist. To load multiple songs from the album list, use either shift + click, or ctrl + click to select the songs, and then drag the selection into the playlist. To start the list playing, simply click the play button. To change what song will play next, select a different song in the list and leave it selected. DML will jump to the selected song next. To stop playing a song, simply click the stop button. To stop playing a song and play another, double-click the new song and it will immediately start playing. To pause play, press the spacebar. Pressing the spacebar again will resume play. When a song is playing, the album cover from the album that the song is from is displayed on the right top side of the screen - beside the player controls - as seen in the image below. 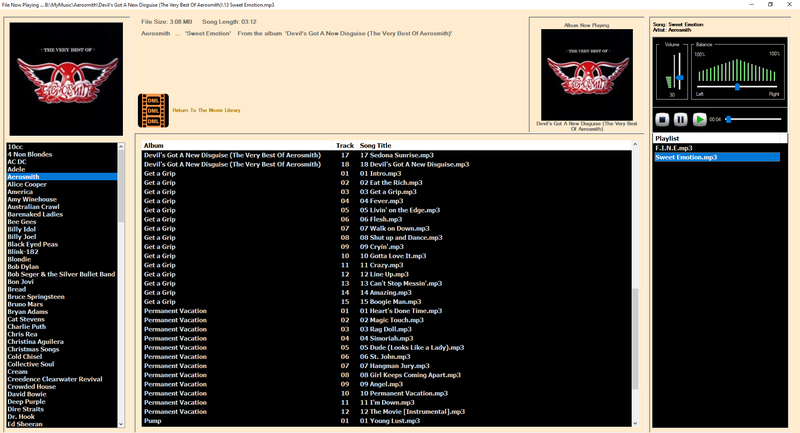 Information about the currently playing song is displayed in the information bar at the top of the screen as well as in the currently playing album image panel, and the panel above the volume and balance controls - as seen in the image above. 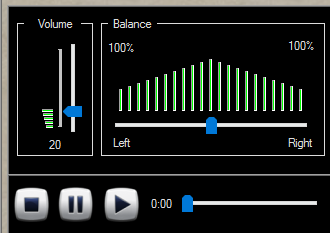 When the mouse is held over a song in the playlist, the song name and artist will replace the current song details in the panel above the volume and balance controls. The volume control levels are relevant to the level set on your sound system. For example, if you are playing your audio through a television or computer screen, the base volume is set by the current screen volume level. If your system is setup to play sound through your stereo system then the base volume level is set by the stereo. Use the mouse to click on the volume slider bar shown in the image above (above or below the blue slider) to adjust the volume up or down by 10% or click and drag the slider up or down to the desired level. Pressing the – key will decrease the volume level by 10% until the current volume level is equal to or below 10% then it will decrease the level by 1% until the current level = 0. If the current volume level is below 10% pressing the + key will increase the level by 1% until the current level = 10, then it will increase by 10%. Right-click over the playlist to initiate this menu. This menu option loads a saved playlist. Up to 5 playlists can be stored in the music library. This menu option saves the selected songs as a playlist for quick retrieval. This menu option deletes the selected playlist from the library. This will remove the selected song from the list (To remove it from the saved playlist, save it again using the same name the playlist is currently stored as). This will clear all songs from the list.